• Can't-get-enough-of-it recipes, including the popular Applesauce Cake with Cream Cheese. • Inspiring menus for social gatherings, holidays and more. • Helpful timelines for flawlessly throwing a party. • Oh-so-helpful "It's Me Again" recipes, which show how to use leftovers in new and delicious ways. • Tips on how to be smartly thrifty with food choices. 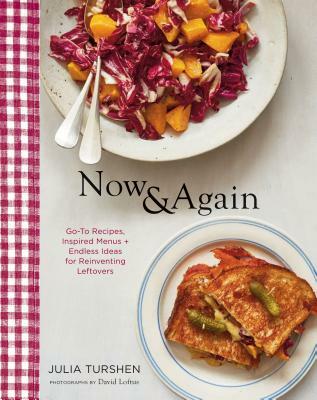 Now & Again was named one of the most anticipated cookbooks by Eater, Epicurious, Food & Wine, Delish, MindBodyGreen and was selected a New York Times notable pick. It was also selected as one of the Top 10 Jew-ish Cookbooks by The Forward, and nominated for a Goodreads Choice Award for Best Cookbooks 2018. Julia Turshen is the bestselling author of Now & Again, Feed the Resistance, named the Best Cookbook of 2017 by Eater, and Small Victories, named one of the Best Cookbooks of 2016 by the New York Times and NPR. She has coauthored numerous cookbooks and hosted the first two seasons of Radio Cherry Bombe. She has written for the New York Times, the Washington Post, the Wall Street Journal, Vogue, Bon Appétit, Food & Wine, and Saveur. Epicurious has called her one of the 100 Greatest Home Cooks of All Time. She is the founder of Equity At The Table (EATT), an inclusive digital directory of women and non-binary individuals in food. Julia lives in the Hudson Valley with her wife and pets. David Loftus is a food and lifestyle photographer based in the UK. A Washington Post Best cookbook of 2018!